Upcoming Competitions - ACF Chefs de Cuisine Association of St. Louis, Inc. 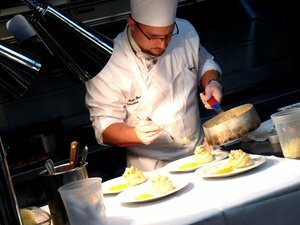 Check our events page for the Chef's de Cuisine's local spring competition. The competition normally falls in the month of JANUARY and may feature student, professional and team competitions. Check our events page for the Chef's de Cuisine's local fall competition. The competition features the CHEF OF THE YEAR battle. Along with this prestigious award, other styles of competition such as student, professional and team competitions are available. This is typically held in the month of SEPTEMBER. Participating in one of our heated culinary competitions could earn you top recognition and will open the door to new career opportunities. Competitions play a vital role in culinary arts as they continually raise the standards of culinary excellence. There is no better way for a culinarian to hone their craft than by putting their skills an knowledge to the test in a competitive format.